In keeping with Wizards of the Coast’s Free Basic Dungeons & Dragons rules you can also get a free basic version of Esper Genesis! Not only does the free game allow people to see what they’re getting into at no cost to them and it also allows people who own the Core Manual to play while the Threats Database and Master Technician’s Guide are being worked on. 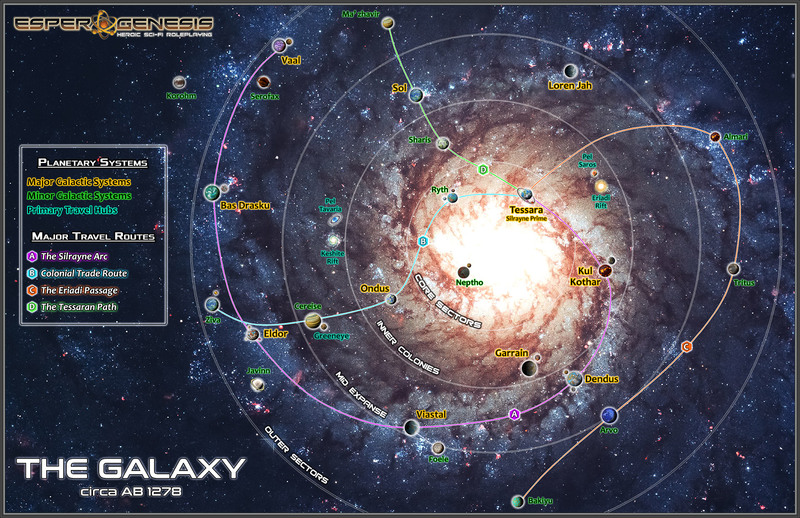 The Free Esper Genesis Basic Rules consist of: The EG Basic Rules, EG Game Master Basic Rules, Fall of Eos Keldor Adventure, Character sheet, pregenerated characters, galaxy map, Crucible Corps organized play guide. You can get all of these as direct downloads below or for free through DriveThruRPG. We recommend getting them through DriveThruRPG as you’ll be notified if they’re ever updated. A chapter explaining how creatures work in EG and advice on customizing NPCs. Falsely accused, you find yourselves prisoner aboard the flagship of the Lorendi Imperium. In the midst of a major battle gone sideways, it won’t be long before everything around you is reduced to space dust. Fall of the Eos Keldor is a free four-hour introductory adventure for the Esper Genesis Roleplaying Game. It can be played on its own or as part of your 5E sci-fi campaign. Prepare to forge your galactic hero and journey into the great expanse with the Esper Genesis character sheet. This sheet is available for FREE download, allowing you to record all of your character’s ability scores, modifiers, skills, weapons, feats, backgrounds, esper powers and more. Crucible Corps is the official ongoing organized play campaign for the Esper Genesis Roleplaying Game. As long as you have an official character created using the Crucible Corps guidelines, you can play virtually anywhere a Crucible Corps game is being run. Crucible Corps characters are created using the EG Basic Rules or the Core Manual, along with the Crucible Corps Campaign Guide.